Poll: Could Trump beat Obama in 2012? (CNN) – The notion of Donald Trump running for president is far-fetched to be sure, but a new poll released Tuesday suggests the real estate mogul and perpetual publicity hound could just beat President Obama. A new survey from Newsweek and The Daily Beast indicates President Obama is ahead of Trump by only two percentage points, 43-41, well within the poll's sampling error of plus or minus 3.5 percent. In fact, Trump fares far better against Obama than Sarah Palin, who would lose to Obama by 11 points, 51-40, according to the poll. Trump also performs roughly as well as former presidential candidate Mitt Romney, who is 2 points behind Obama in the survey, 49-47 percent. Mike Huckabee, another former presidential candidate, does best against the president in the poll: both are tied at 46 percent. Trump, as in previous election years, has repeatedly said he is interested in running for president. But the famous billionaire received a mixed reception at a recent gathering of thousands of conservatives and he must contend with previous stances that included support for abortion rights and universal health care. He's also given money to several Democrats in the past and was a strong supporter of Hillary Clinton during her bid for the White House. 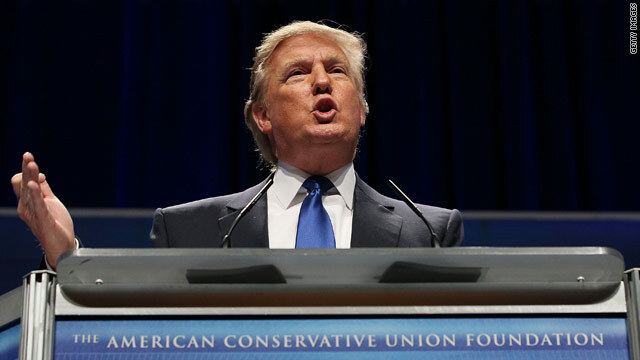 Still, the new survey indicates Trump is in the high single digits among Republicans when it comes to their choice of the GOP presidential nominee – ahead of a string of more bona fide conservatives like Tim Pawlenty, Newt Gingrich, Haley Barbour, and Mitch Daniels. Of course, Trump's sky-high name ID likely has something to do with that. In fact, only three candidates are ahead of Trump in the GOP presidential race – Romney at 19 percent, Huckabee at 18 percent, and Palin at 10 percent. The poll, conducted between February 12-15, surveyed 918 likely voters and carries a sampling error of plus or minus 3.5 percentage points. Could pigs fly out of my behind CNN??? Trump? Oh, please. What next, Leona Helmsley's dog for president? God help us. It seems things get worse with each day that passes. Canada is looking more appealing everyday. What the world would think if we elected that money hungry idiot! It looks as though the love of money with no integrity or morals is where our country is heading. For the first time in years we have a president with character and a true devotion to the middle class but don't appreciate him. Very, very sad. ROTFL . . . Your so called polls has lost all credibility. Question, who did you poll, Trumps apprentices? CNN is a joke. You guys at CNN must be desperate for readers. Keep this up and you will differently lose your base. "Bush has been so bad, maybe the worst president in the history of this country. He has been so incompetent, so bad, so evil that I don't think any Republican could have won." I think [Obama's] going to lead through consensus. It's not going to be just a bull run like Bush did. He [Bush] just did whatever the hell he wanted. He'd go into a country, attack Iraq, which had nothing to do with the World Trade Center and just do it because he wanted to do it." Is this a formula for success in the Republican primary? No. Please, not another pompous opportunist. We need jobs, not entertainment. Not in a million years will this poll make any sense. Trump is a Chump ! Here is a joke for you. How do you know when the Republican Party is doomed for good ? When Trump the Chump polls higher then Romney. Thank God polls are about the same as a reality TV show, for entertainment purposes only. If Trump is the best the Republicans can do, they are never going to survive the primaries, Barney Rubble is more qualified and able then Trump will ever be.Once again Republicans make the world laugh out loud at the cartoon characters put up as Republican candidates. Could trump beat obama? Doubtful. I don't think there's enough room in the white house for trumps oversized ego. The tough guy bravado wouldn't work well in foreign policy – look how well it worked for bush. Trump is transparent, and doesn't have the skills necessary to run the country. Face it, his history of running his own empire isn't exactly stellar – he couldn't just claim bankruptcy for the country and walk like he does in business. This is all a stunt to fuel his ego and gain publicity. Poll me! No I wouldn't vote for Trump! Are you kidding me ??? Is this a JOKE ??? If three candidates are ahead of Trump including Palin, and Palin could lose to Obama by 11 points; where is the logic in the Polls Trump could just beat Obama? LOL ... Obama has been the subject of national attention and a barrage of criticism for the past four years. No one has ever gone after Trump in the same way. If they did - for example, what do all his former wives, girlfriends, paramours, business associates, etc have to say about him, to say nothing of Saturday Night Live - his numbers would drop like a rock. I don't think Trump fully understands government enough to be a very effective president. He'd want to fire Congress which he can't do. He's so business that he might ask Congress to repeal unemployement and defund the labor department among other things. As an american it seems to me we just got back to the point where it is ok to be american. Im not saying that Trunp would be good enterainment for americans as president but we should "stay the course" until other counties can see that we can get along with our own demorocy since we love to impose our view on other countries. This polls demonstrates why all this arly coverage of the race for the Republican nomination for President is mostly hot air. I think Joe he Plumber could get similiar polling results. It would be nice to see CNN explore the issues facing this country in some depth than printing all the frou-frou. Donald Trump has failed in many enterprises. Why he would be a good President ? Theres only one person that can beat Obama and hes not mentioned in your article.